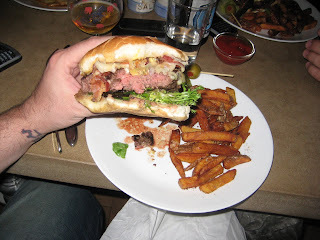 After consuming a whopping (no pun intended and no Whopper eaten) 156 burgers in 2009, I thought it might be fun to count back some of my favorite burgers of the year. 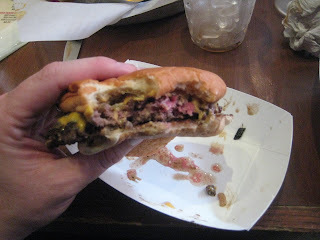 While everyone else was putting together lists of their favorite burgers (A Hamburger Today has a particularly good one, 3 of which I was present for the consumption), I thought it would be to give my list a little twist! 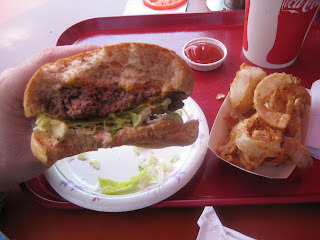 If you wanted to know what we rank as the best burgers, it’s ALWAYS listed on the upper right corner of the site. Re-posting would be pointless. 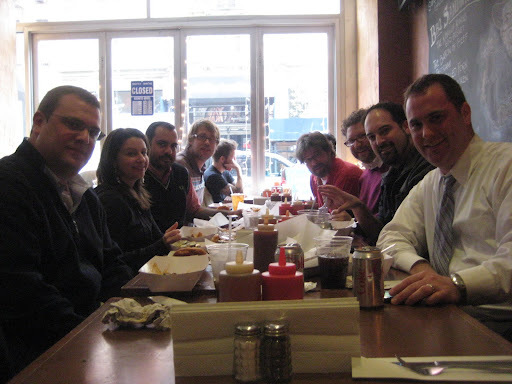 So, in the tradition of “12 Days of Christmas” I give you the final tally in my “12 Days of Burgers,” the 12 best Burger Conquest stories of 2009. 12. Black Sabbath, Sippin Whiskey and tears of joy. 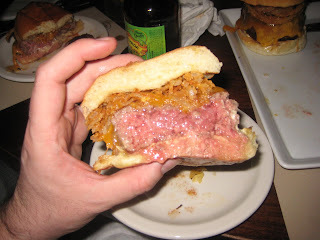 – Kuma’s Corner in Chicago, IL. 11. 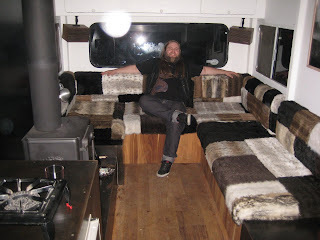 Get me a Scion, a giant skull I can walk through & peanut butter on my burger. – The Vortex in Atlanta, GA.
10. 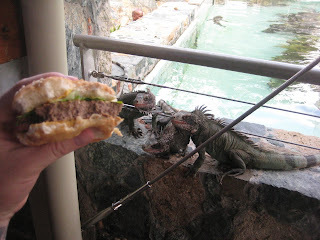 Fat Turtles, Hungry Pirates, Large Sharks & Attacking Iguanas. 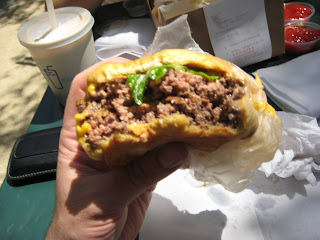 – 3 Burgers St Thomas. US Virgin Islands. 9. What do tube amps, deers & bats have in common? 8. 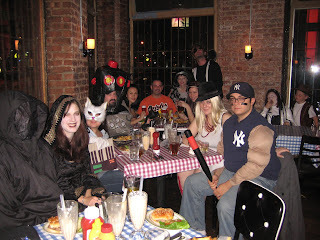 The first ever Burger Conquest Costume Burger Ball. 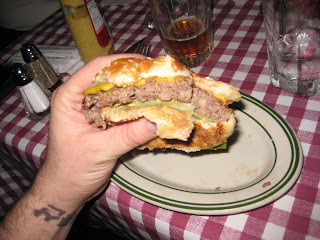 – Bill’s Bar in New York, NY. 7. 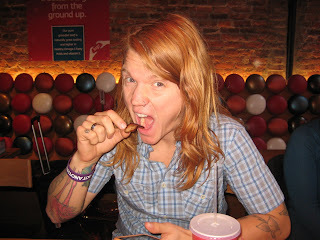 Our 1st ever video interview and a fun blog exchange with Aaron Gillespie from Foodisms. 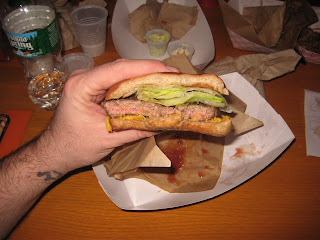 – BRGR in New York, NY. 6. 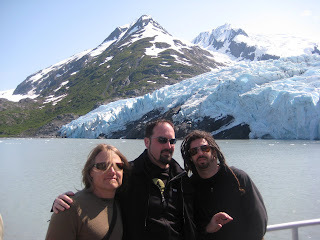 Ate a burger and climbed a glacier with the band Shadows Fall for MetalSucks. – Arctic Roadrunner in Anchorage, AK. 5. How did we celebrate our 1st birthday? 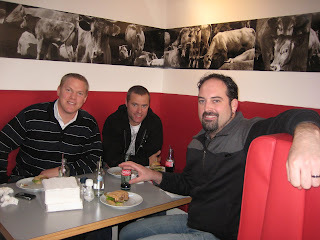 Eating burgers in the Netherlands. 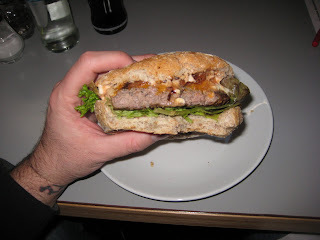 – Burgermeester in Amsterdam, NL. 4. 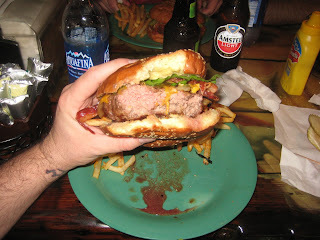 Free Burgers flambeed in tequila and Makers Mark, you would’ve done the same. 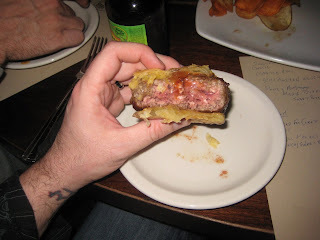 – Rare Bar & Grill in New York, NY. 3. 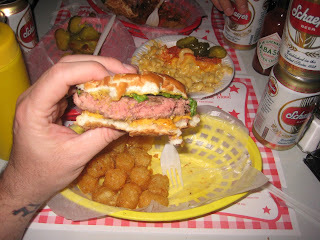 Getting burger stoned with George Motz from Hamburger America & Andrew Schnipper while eating a ton of Quality food. 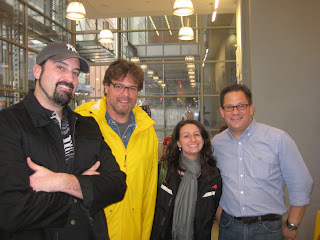 – Schnipper’s Quality Kitchen in New York, NY. 2. 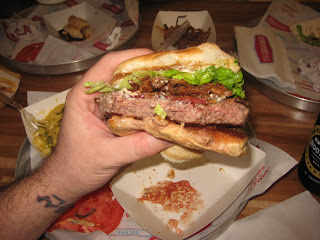 The Burgeratti – we bring you the burgers fine to eat. 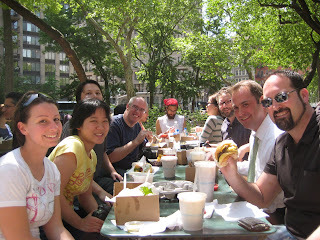 – The Burgercon’s; Shake Shack, Trailer Park and RUB in New York, NY. 1. 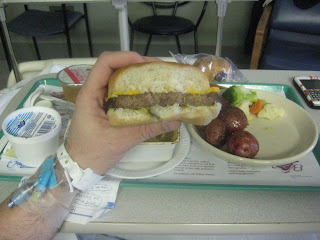 Getting served a burger while hospitalized, only this happens to me. 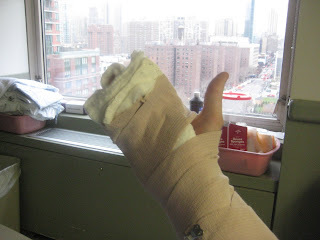 – St. Luke’s-Roosevelt Hospital in New York, NY. 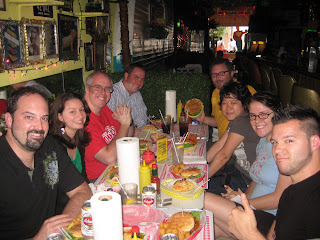 Thanks to all our readers, my fellow Conquesters and all the fine places that made 2009 a Glorious Pursuit For Delicious Burgers. Here’s to 2010!!!! 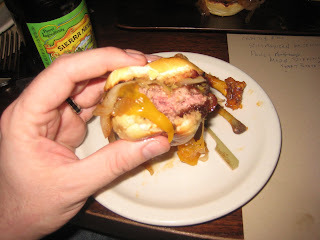 This entry was posted in Bar, Best Of, Burgers, Gourmet Burgers, Hamburgers, New York and tagged 12 days of burgers, aaron gillespie, Arctic Roadrunner, bar, best burger, best burgers in nyc, bill's bar, brgr, burger blog, burger club, burger conquest, Burgermeester, cheese, ciancio, david, french fries, gourmet burger, great burger, hamburger, kuma's corner, nyc, oddfellows, Rare Bar & Grill, restaurant, rev, review, rub, schnippers quality kitchen, shadows fall, Shake Shack, St Luke's Roosevelt Hospital, st. thomas, the vortex, trailer park. Bookmark the permalink. I'm sorry, I was told there would be tacos here. Sorry for the intrusion. Where's Miller's? I wanna go back to St. Thomas!